Anna is a shining example of an adult learner. She is one of B Sharp Studio’s adult Bronze level certificate holders and had fun earning it. With her strong chord vocabulary she no longer turns the page on a song because she sees a foreign chord. Recently she’s begun stylizing her playing with bass walks and direct substitutions that add interest and variety to her playing. Anna also derives great satisfaction from her newly acquired songwriting. 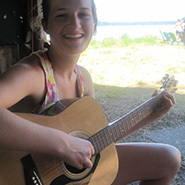 Anna performed in B Sharp Studio’s Holiday benefit concert for the food bank and is one of the original B# performers ‘busking for the food banks’ on a chilly street corner, strumming up money for the West Seattle and White Center Food Banks. Arthur exemplifies what love of the instrument does for a player. He was ten when he first came through my door; left at nineteen with a more discovered fretboard than most players have at forty. His last year and a half with me was spent immersed in sight reading, an aspect of musicianship he’d been willing to flirt with but not court. He excelled at technique and, still in his teens, was an improvising master. He was one of four to achieve B Sharp Studio’s Gold certificate, then off he went across the country to Boston’s Berklee College of Music, graduated, and is now embarked on a music career in Los Angeles. Click to hear Arthur’s group play as one of ten picked for Berklee’s Guitar Night 2010. Ben is an excellent example of what can be achieved with an hour and a half of practice a day. When Ben began his study at B Sharp Studio he had trouble alternating three fingers of the right hand as the left spidered over a two octave scale, but after witnessing his diligence in the first month I knew he would not be average. An incredible sight reader, Ben reads notes the way other people read the news, a valuable gift for a classical player with a broad repertoire. Ben is one of four students to achieve the Gold Level certificate. Bob holds down the bottom end for the Five Buck Band. One of the founders of 5 Buck, he’s a veteran with over 25 night club, festival and charity performances. Bob played electric bass with a band in high school; put the bass in the closet for 30 years and took up clowning, his natural occupation. As president of Clowns Unlimited he helps out B# with stage, rain canopy and other equipment when we play charity fundraisers. A top of the line rock/pop player with a versatile finger in Jazz and other styles, Brendan is one of only four students to earn B Sharp Studio’s gold level musicianship certificate. 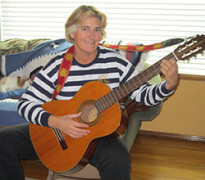 He decided late in his musical life to learn to read music, and in a subject difficult for most adults, Brendan has succeeded beyond expectation. The Lead Guitarist for Hotels* Brendan plays a fresh surf style of music with an original 1965 Fender Jaguar, and a Gibson S G . His command of the fretboard allows him to improvise readily with the tried and true, and with eccentric scales. His astute application of harmony comes out in his songwriting bringing fresh wind into today’s rock sounds. 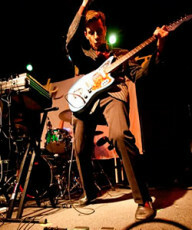 With Hotels Brendan has played Los Angeles, Portland, Austin, and San Francisco. See him in Seattle playing with Beachdick and with Gods to Monsters at the Crocodile, Neumos, Rendezvous, Showbox Sodo, and other clubs. 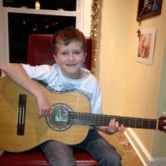 New to guitar lessons but not to music, Graham has already played a guitar duet in recital. At Graham’s school Explorer West, everyone plays an instrument, and sings in the choir: Yeah! Graham’s on clarinet by day, but when the sun goes down you’ll hear guitar riffs coming from his window. 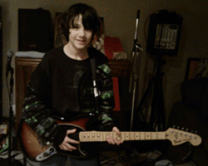 Learning by a formal approach, Graham has already earned his first B Sharp Studio certificate for note reading, another for music fundamentals, and a third for fretboard knowledge. He plays using a flat pick, and a classical right hand; and works weekly on his chord vocabulary, scales, and a repertoire of Beatle songs and other rock standards, as well as on classical pieces of music. This kid’s got the knack. The more he plays the more he wants to play. Jaden holds the Bronze Level 1 Junior certificate. He reads music, and knows a bunch of new and vintage rock songs, and plays them just like the recording. Jaden plays sometimes at Teacher Lou’s music class at Tilden school; he also played with his friend West at the West Seattle Art Walk with a bass player and a drummer and everything. 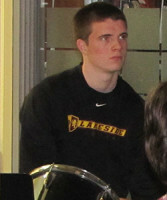 Hey that’s Jaden in the West Seattle Blog. Graced with a lovely voice, Janet took up the guitar to accompany herself. After starting lessons, she joined a band of students coached by B Sharp Studio. Now she’s the front girl, the chick in the band, and she got them their first gig, raising money for breast cancer research. A couple dozen gigs later she’s singing hits from 1958-2011, and beginning to strum her guitar with the band. She knows the primary chords in the guitar-friendly keys, and plays a number of two, three and four chord songs. She’s beginning to learn moveable (bar) chords, fundamentally reads music, and understands the relationship of key, chord, and scale. Janet also sings with a Christmas trio “We 3 Carolers”, and during the Holiday season you’ll likely see her singing in the West Seattle Junction for the local Food Banks. 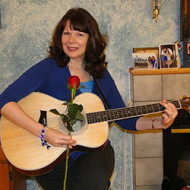 Here Janet is seen with a single rose; she enjoys arranging flowers for weddings and other events. This chick kicks a tight beat; another adult student having fun playing music. Kim spends half her lesson learning to read, write and recognize beat variations. Then we go into the big rehearsal room and combine her drumming with a guitar, play songs and grow her repertoire. Kim sits in with the 5 Buck Band during the Art Walk at Windermere real estate in the West Seattle Junction the second Thursday of the month. An agent herself she’ll be happy to show you a listing. The Swede with Swiss timing. If it starts at 120 it’ll end at 120 even when the song includes triplets, rubato, and ritardandos. In the brains of many musicians an increase of volume or energy dictates an increase in tempo. Liam has never needed to overcome this tendency. His strong musical intuition leaves him easy to teach. When the crew in Greenwich reset their clock they call up Liam. Before leaving for Florida and college, Liam took formal drum lessons. Half his time was spent reading, writing, and taking beat dictation; then in the rehearsal room we worked on songs. Songs in 4/4 3/4 2/4 and the compound meters of 12/8 9/8 6/8 as well as shuffle blues, straight eight blues, and more eccentric meters of 5/4 and 6/4 time. He learned how to fill (add musical punctuation) and with his innate sense of time has always known where the beat partials are: “kick it in on the and of three.” Liam’s repertoire of rock, pop, blues and country extends from 1956 to 2012. He played the Fauntleroy Fall Festival and the West Seattle Art Walk, and reached the Silver certificate level for drummers. Mark graduated from M.I.T.’s School of Architecture, and is representative of the diverse backgrounds of students at B Sharp Studio. Mark learns by playing. To accommodate his recent interest in blues we took a 12-bar progression in E and also in A, playing it first with chord forms, then again using a blues device that substitutes for the chords. Next we added the pentatonic scale played in one position, and using it, he improvised over the progression. We continued by adding the flat 5, a chromatic note characteristic of the blues, to his pentatonic scale. Then we expanded the reach of the pentatonic scale over 12 frets and 3 octaves. Our next step will be trading off, learning to move readily from chords to the solo and back again. Max knows the fundamentals of reading music, although he prefers to learn songs by rote or by tablature. He brought in a recording of Take Me Out, a song of many parts, by Franz Ferdinand, and diligently learned the whole song a part at a time. Max likes playing electric guitar the most, but has a hand in acoustic styles too. Mike’s a late-blooming over-achiever. Starting in his forties he developed guitar skills by learning songs of his choosing – learning one in a simple way, then in review a rendition of medium difficulty, then in another pass at the song in its recorded version. Mike holds B Sharp Studio’s Bronze certificate and is working hard on the Silver. 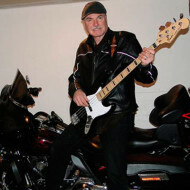 Mike, with fellow bass-man Bob, is a founding member of the Five Buck Band, and a veteran of over 25 live performances laying down a steady rhythm with six and twelve strings, and singing supporting and lead vocals. Mike gets a feather in his cap for organizing the B Sharp Studio’s Holiday Concert for the Food Bank that raised $888.00 for southwest Seattle area food banks. Riley has a lot of musical ability waiting to be tapped. He takes lessons on the electric guitar, but once I sat him on the throne for a drum lesson, and with little exercise, had his hands and feet working independently, and kicking a steady beat. In weekly lessons Riley reads notes, expands his guitar chord vocabulary and scales, and applies these to songs. 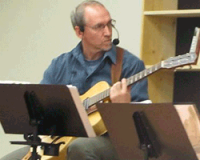 He performed at B Sharp Studio’s Holiday concert, and at the monthly West Seattle Art Walk. A blue ribbon personality you have to like from the hand shake. If you’re lucky you’ll be the victim of her delicious sense of humor, and maybe she’ll introduce you to her water spaniel Brydie. Tierney comes to lessons with her Dad Pete, who shares the lesson time with her. She likes lots of music and plays classical, folk-rock, and cool old tunes she and her dad find in attics and old shoe boxes. Recently she went east to the University of Virginia to see what Thomas Jefferson knows. Rumor has it she and old Tom are making beautiful guitar-violin duets together. Todd learns best when he can apply today’s lesson to his band’s rehearsal tomorrow. 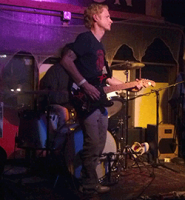 Recently Todd demonstrated a song he’d written, and played a pentatonic solo over its progression. The melody of the song was defined by a recurring tone known to musicians as a 9th. I suggested he add the 9th into his pentatonic solo (5 note scale) bringing the character of the melody into his guitar lead rather than departing from it. Todd helped B Sharp Studio raise $888. for the food bank with his Blues performance during our holiday concert on Youngstown’s great West Seattle stage. 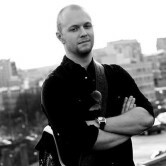 His band 25 Cent Ride plays originals and covers at many Seattle venues. 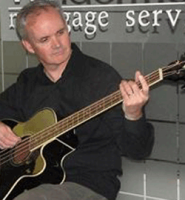 Tom is an adult learner who came back to the bass after many years. 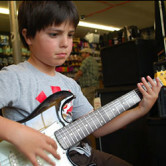 He’s a steady learner by a semi-formal approach; performing exercises and etudes for technique, chord vocabulary, scales, fretboard knowledge, and theory, applied to songs. One song “walks”, another is “chorded”, still another is chorded with scalewise walking between. Tom knows how to play in simple and compound meters, understands how each sounds and feels, and has a good list of songs under his belt. Here Tom is playing the West Seattle Art Walk. Torin comes through my door each week with his 3/4 size guitar, his infectious smile and a ready attitude. From his time as a piano student he brings acquired musicianship; it’s always apparent when a student has previous musical experience. Torin also shows astonishing power of observation and an aptitude for reading notes, a skill of great value to a classical guitarist. He pays close attention to his fingers, and readily performs rest and free strokes with a well exercised classical right hand. One day Torin mentioned a fondness for 50’s rock and roll. So we get into that too. At a recent recital featuring guitarists, pianists, and wind players, Torin confidently performed a Theme And Two Variations, his first public performance on classical guitar. Veronica “The Brave” volunteered to be the leadoff act in B Sharp Studio‘s Holiday concert for the Food Bank. She’s a veteran live performer including three Holy Rosary school talent shows with her tuneful friend Phoebe on the microphone. Veronica reads music, has a strong chord vocabulary, and a repertoire of Beatles, Taylor Swift, and indie rock. Recently she’s taken an electric guitar to her knee, and strains of alternative rock emanate from her room. When you’ve got the coolest name left of the Mississippi no one’s gonna forget you. Add a blond mop, and an electric guitar and it’s just plain criminal. Wait a minute he’s got purple hair now. He’s been dying it blonde all his life. West has got sticky fingers; he just likes to pick up the guitar a lot, and displays an impressive rock and roll technique. He’s got the bronze Junior certificate on the wall, and is developing into a fine reader of music. He and his friend Riley played a medley of spy songs (007, Secret Agent Man, Peter Gun) at the B Sharp Studio Holiday fundraiser, and West got in your face with some Green Day tunes at the West Seattle Art Walk. He also played as part of Teacher Lou’s music class at Tilden School, and at his new school Explorer West he’s taken up the alto sax. Is he really a natural purple? Only his hairdresser knows for sure.